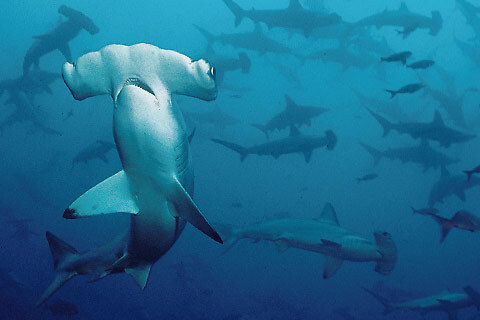 Hammerhead sharks are one of the most unusual and distinctive-looking sharks on the planet. The great hammerhead, scalloped hammerhead, and smooth hammerhead - all members of the Sphyrnidae family - carry their namesake broad, extended flat head; a shape like no other. Researchers have studied hammerhead sharks to determine why it evolved with such a unique head shape. There has been research that indicates it is an effective tool for hunting: digging and flipping up small rays out of the sand. Other research has shown that the wide positioning of the hammerhead's eyes provides it with stereo vision - the ability to see straight ahead more easily which might prove to be a predatory advantage. 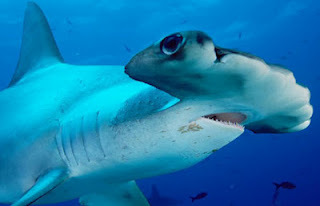 And there have also been studies regarding the possibility that the hammerhead's shape enhances it's ability to sense electrical fields with its Ampullae de Lorenzini (the black specks or five o'clock shadow all around the snout of most sharks) which could aid in long range navigation. Definitely one of the world's most unique sharks, but also one that has been severely impacted by commercial fishing. In the eastern Pacific, at locations such as Cocos Island, off of Costa Rica, researchers and long-time divers can remember immense schools of hammerheads cruising through the deep waters. But no more. The occasional school can be encountered but their numbers are greatly reduced and such a sight is a rare occurence indeed. Researchers from Mexico, the United Kingdom, USA, and other countries have been studying the hammerhead sharks using telemetry tags and taking biopsy samples for DNA studies to better understand the movements of these sharks and whether there are isolated populations moving around in the Pacific and elsewhere or whether any genetic co-mingling takes place. This knowledge can be used in determining the best approach for conserving the sharks and managing commercial operations between Central American nations. Costa Rica and Honduras, Central American nations that have recognized the importance of biological diversity not only for the sake of their own ecology but as an important feature of their tourism revenue, plan to put forward a recommendation at the next convening of the Convention on International Trade in Endangered Species (CITES) in March of 2013. Recommending that scalloped hammerhead sharks be given an Appendix II status will then require the 175 member nations of CITES to ensure that trade is sustainable and legal. For some hammerhead advocates, this is not sufficient action - hammerhead sharks are already listed as endangered by the International Union for Conservation of Nature (IUCN) - but it is a step in the right direction on the international front as it represents regulations and actions that must be taken by CITES members. Of course, having the resources to implement and maintain enforcement has always been an issue with many countries, so much remains to be seen. Research completed over the past few years by groups like the Sea Turtle Restoration Project (PRETOMA) have shown hammerhead movements to extend beyond national boundaries with populations moving between the Cocos Island and Columbia and Ecuador. Because of this, Costa Rica and Honduras are hoping that they will not be lone voices at the CITES meeting next year. Many shark conservation groups will be watching what CITES does on behalf of the hammerhead sharks in 2013.